the Website Owner may at any time modify any relevant terms and conditions, policies or notices. You acknowledge that by visiting the website from time to time, you shall become bound to the current version of the relevant terms and conditions (the “current version”) and, unless stated in the current version, all previous versions shall be superseded by the current version. You shall be responsible for reviewing the then current version each time you visit the website. 11.3 Conflict. Where any conflict or contradiction appears between the provisions of these website terms and conditions and any other relevant terms and conditions, policies or notices, the other relevant terms and conditions, policies or notices which relate specifically to a particular section or module of the website shall prevail in respect of your use of the relevant section or module of the website. 11.4 Waiver. No indulgence or extension of time which either you or the Website Owner may grant to the other will constitute a waiver of or, whether by estoppel or otherwise, limit any of the existing or future rights of the grantor in terms hereof, save in the event or to the extent that the grantor has signed a written document expressly waiving or limiting such rights. 11.5 Cession. The Website Owner shall be entitled to cede, assign and delegate all or any of its rights and obligations in terms of any relevant terms and conditions, policies and notices to any third party. 11.6 Severability. All provisions of any relevant terms and conditions, policies and notices are, notwithstanding the manner in which they have been grouped together or linked grammatically, severable from each other. Any provision of any relevant terms and conditions, policies and notices, which is or becomes unenforceable in any jurisdiction, whether due to voidness, invalidity, illegality, unlawfulness or for any reason whatever, shall, in such jurisdiction only and only to the extent that it is so unenforceable, be treated as pro non scripto and the remaining provisions of any relevant terms and conditions, policies and notices shall remain in full force and effect. 11.7 Applicable laws. Any relevant terms and conditions, policies and notices shall be governed by and construed in accordance with the laws of Ireland without giving effect to any principles of conflict of law. You hereby consent to the exclusive jurisdiction of the High Court of Ireland in respect of any disputes arising in connection with the website, or any relevant terms and conditions, policies and notices or any matter related to or in connection therewith. 11.8 Comments or Questions. If you are using amberdrivertraining.ie web site, you are agreeing to the terms and conditions, please make sure that you understand them. Amber driver training own the rights for the designs, pictures, logos, photographs and content of this web site with exception to anything relating to the RSA Road safety authority, these are protected by copyright unless otherwise stated. This means that you may view or download material displayed on the site for non commercial use. You cannot copy, duplicate, alter, distribute, publish, display, post or broadcast any part of the site without full written permission of easyDrive Driving School. We ensure to our best that the content is accurate, we accept no liability or responsibility for any errors in the content of the site and you should not rely on it to initiate or make decisions. The site is for your personal use only and should not be used for any commercial purposes. We can’t be responsible in any circumstances for loss of data, viruses or for any loss such as exhausted spending and dishonesty. You use this site at your own risk. Amber driver training web site provides links to other Internet sites and we don't have control over these sites and can't be responsible for their availability, content, services or any other materials on or from these sites. Gift Vouchers are available for the value included in the price list and are valid for the time stated on the voucher. Pass rates are based on a basis of students being of test standard and and have successfully completed our pretest course. Special offer buy four essential driver training driving lessons for the price of one applies to those taking essential driver training lessons only. The offer does not apply with any other offer or promotional discounts. The offer or regarding offers may only be used one time per person but can be bought multible times for other persons or gifts. To take up the special offer you must need all twelve essential driver training lessons. 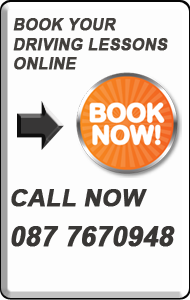 You must be living in Dublin and for those living outside of dublin the offer is non complience with the exception that the person is willing travel to meet easyDrive Driving School. The offer applies if you are not a student, it applies to all others if you are taking all twelve essential driver training lessons with easyDrive Driving School. The price list for the online booking service will vary to the standard price list due to surcharges applied by the online banking system. All prices and special offers are subject to change at any time. Discounts apply only when paid in full. Refunds on block bookings cannot be given after two months of purchase date.Introduce a friend for free offer applies to the person introducing a friend and is valid for 2 months. Two working Days cancellation notice on all bookings to be given otherwise fees must be paid in full. All driving courses and driving lessons are subject to availability and may alternate. If this driving school cancels lessons the lessons will be refunded or rebooked for a time that suitable to the applicant.Pass Promise guarantee: This offer cannot be used in conjunction with any other offer.One driving test fee for each course is applicable. If any lessons are not completed or cancelled for any reason this agreement is void. Obviously you should not attempt this course if you have no driving experience. You should follow your instructor’s advice on structuring lessons and practise. The guarantee consists on full completion of the 5 week course. We will pay your driving test fee's untill you pass but Test fees will only be paid on completion if you fail the test and we take you to your second test. If you wish to use the School car for the driving test. For safety your driving standard must be at a satisfactory level for a driving test. We reserve the right to refuse the car for safety concerns. . Amber driver training web site terms and conditions may change at any time. All online payment made to easydrive.ie are refundable through easydrive.ie. All payment made directly to your driving instructor are refundable only thourgh your adi instructor.